Introduction to Metal Casting: From ages immemorial, metal has been a faithful companion of the human in peace or in war. 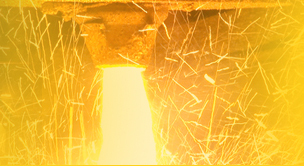 To refine the metal that is unearthed from the core of the earth and to melt and shape them a variety of techniques has been developed, which is generally termed as castings. With the passage of time casting has progressed dramatically from being a small household activity to a sophisticated industrial activity. » Pattern making: The first and the most important step is to decide the pattern or the design of the casting. Pattern is the exact imitiation of the component that is to be produced by casting. The patterns which are usually made of wood, plastics or metals are used to give shape to the mold cavity in which the metal product will be casted. Pattern-making is an important aspect that affects the beauty of the end products. A pattern should be provided with the necessary Contraction allowances, Draft allowances, Sprues, gates, risers, cores, and chills so that the product manufactured has all the intricacies as expected. » Cores: Pattern are designed to be easily withdrawn from the mold, hence they have certain limtiation in repect to providing intricate internal and external designs. Core is used to form the internal cavities by inserting the core into the mold. The cores helps in providing complex internal cavity. For eg. the water-cooling chamber which is formed insided the internal-combustion engine. Core are usually made of sand, wood, iron, steel, etc. and designed by the pattern department. Multiple cores are used so that perfection can be maintained to the minutest detail. However, keeping the economic and time factor in mind sometimes the mold are designed that does not need a core. » Molding: Once the pattern is decided the mold for the casting is made. The process of making the mold in which the metal is to be casted is called molding. The molding process is usually referred by the material used for the mold and the method of making the mold. The mold is made by packing the aggregates like sand and plaster around the pattern, and when the pattern is remove a cavity is formed where the molten metal will be casted. The quality and cost of a cast is largely depended on the type of mold used. Several factors are considered prior to the casting like the metal to be poured, the intricacies of the casting, the kind of foundry operations and the the size of the casting. » Melting and pouring: Metals and alloys are melted in a crucible at a fixed temperature. After melting the molten metal is removed from the furnace and poured into the mould. The pouring is carried out by using gravity or pressurized gas. In modern day robots and automatic pouring machines can also accomplish the task. The temperature of the the metal is controlled, since inaccurate pouring temperature can cause casting defects. If the temperature of the metal is less then it causes cold shut. On the other hand if temperature of the metal is high in the case of metals like aluminum, then the gas content will increase. » Solidification: Cooling down of the metal and solidifiying in the shape of the mold is known as solidification. The mould is designed to allow an orderly solidification of the mould, taking effective measure to control shrinakage during cooling. The design can be perfected using computer simulation of the solidification. The simulation will give a better understanding of the temperature changes during the solidification process, thereby steps can be taken to cast defect free products. » Cleaning: After removing the mold, the cast undergoes a cleaning process to do away with the extraneous substance like sand scale and excess metal from the casting. The cleaning process is done by cutting, machining, grinding or hammering away the gates, fins, etc. The defective casting are repaired or weld and again undergo the cleaning process. Metal cleaning also involves heat treatment, surface treatment, machining, and inspection. » Some metal can only be cast because they cannot be hot worked into bars, rod, plates and other shapes from ingots. » Construction may be simplified. » Enables to mold the products into one single unit than manufacturing different parts and assembling them. » Favorable engineering properties obtained like Machinability and vibration damping capacity. » Exhibit the same properties regardless of which direction is selected. » Wide range of alloy compositions and properties are produced in cast form. Crystalline Solid Metals and other solids, whose constituent atoms, molecules, or ions are arranged in an orderly repeating pattern, in all directions. Crystal Lattice Sytematic organisation of atoms in a solid. Crystallization Also known as solidification, this is the process of formation of crystals. Grain These are small crystal having a given and continuous crystal lattice orientation. Grains are formed as a result of solidification. Grain Structure The arrangement of different types of grains, with grain boundaries. Chills Metal plates, with special heat removing devices which are used to remove the heat quickly at places where harder structures are required. Chill Zone The layer of the molten metal which is close to the walls of the mold, where the metal cools rapidly and forms an equiaxed structure. Columnar Zone During solidification the crystallites in the columnar zone are elongated in the direction of heat flow. Columnar zone determines the isotropy of the metal, such as the mechanical and magnetic properties. Equiaxed Zone or structure This central- most zone which contains spherical, randomly oriented crystals. Expendable Mold Non-reusable, temporary molds made of sand, plastic, shell and plaster. Non-expendable Mold Unlike expendable mold, here the mold need not be reformed for reuse. 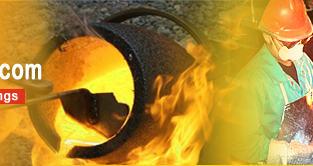 The castings done using this methods are permanent, die, centrifugal, and continuous casting. Fettling The process of removing sand adhering, after castings, by hammering, tumbling or shot blasting. Gates The device that acts like gates for the controlled entrance of molten metal into the metal cavity. Gating System The system that includes sprue, runner , ingate and other devices for the controlled flow of molten metal from the ladle to the mold cavity. Ingate Entrance point of the molten charge into the sand mould.